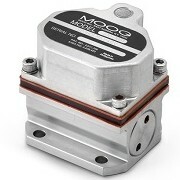 The Moog 30 Series Servo Valve weighs approximately 185 grams (6.5 ounces). Moog Inc. has showed attendees at the 2018 Offshore Technology Conference in Houston the newly released 30 Series Servo Valve for applications in the oil and gas industry such as remotely operated vehicles (ROV), mobile robotics and autonomous vehicles. According to McCall the valve’s step response improves productivity because someone driving an ROV with less dynamic valves will often see a time lag between executing a command and the vehicle performing the action. The 30 Series Servo Valve provides a rated flow from 0.47 to 6.9 l/min (0.125 to 1.85 gpm), and a step response of 2.5 milliseconds at 210 bar (3,000 psi). The 30 Series Servo Valve’s high dynamic response assures accurate pressure control in dynamic pressure applications. The operator of an ROV with 30-Series Servo Valves installed will see time lag almost entirely eliminated, says McCall. Weighing 185 grams (6.5 ounces) and measuring 4.0 cm (1.6 in.) by 3.4 cm (1.3 in.) by 3.9 cm (1.5 in. ), the valve has a power density equivalent to 6 horsepower. Along with the oil and gas industry, Moog has seen interest for its 30 Series Servo Valve from entertainment and theme-park companies that electronically animate 3D characters for film and amusement park rides. “Entertainment companies can use 30-Series Servo Valves to replace their cartridge valves and manifold systems to inject servo-level control into their characters and achieve a very fluid, organic range of animatronics motion control,” remarked McCall. For more information, please visit http://www.moog.com.